Yesterday at a visit to my doctor we received some disturbing news (it wasn’t bad news but it wasn’t good news either) he raised the remote probability that my prostate cancer may eventually spread. The doctor told us there were medications he could prescribe that would take care of the cancer, but it wasn’t the doctor or the medications that reassured us it was the many experiences and blessings we’ve had with and from God. Faith tells us that God will not only bless us but IS blessing us neither of us (Patti or I) went into a panic mode. In fact there was a sense of Peace that cast a power shadow over our car as we drove home. As I read and re-read Psalms 121 the point the Holy Spirit was making with me was the opening comment. I suspect it has something to do with the fact that early Sunday morning we’ll be heading for a week in the Smoky Mountain, which for Patti and I have been a source of Peace since 1997. 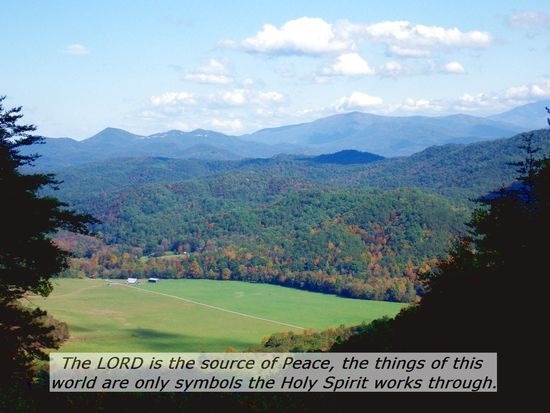 The Holy Spirit was reminding me (and now I am reminding you) the LORD is the source of Peace, the things of this world are only symbols the Holy Spirit works through.